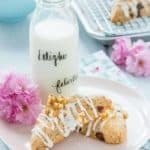 These easy to make, flaky, and buttery Eggless Chocolate Chip Scones are sure to become a family favorite treat. 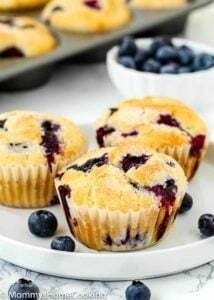 Perfect for breakfast, brunch or anytime! I felt in love with scones when I came to United State more than 12 years ago. But I got to thinking…are scones cookies? Apparently no. Scones are more like a quick bread, usually a little sweet. Scones have way too much liquid (milk or heavy cream) in them compared to cookies, and have a lot more leavening. Some people say that they more similar to a biscuit, but sweeter. 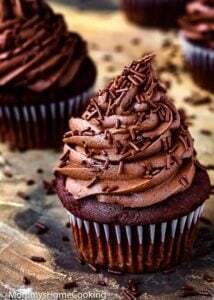 Ultimately… they are delicious!!! And perfect for a bunch or a tea party, or any occasion you can think of. Really. Talking of brunch! Have you noticed that Mother’s Day it’s fast approaching? I just realized it myself, yesterday when I was reading the newsletter from my kids school. For me this celebration is a little bitter sweet, since I love all the extra pampering my husband and kids give me, but I also feel nostalgic because my mom is far away. I know many of you can relate, right? But this is year is going to be extra special since my oldest daughter, Andrea, is pregnant!! Yes, I’m going to be an abuelita (grandma), so double reason to celebrate! A long, lazy breakfast in bed. No eating out that day for me please. Crowded restaurants are not my thing. A homemade simple meal (not cooked by me) would be fabulous. See? Nothing complicated. My husband and my oldest daughter are the first people to read all my post so I know they’ll get my not-so-very-subliminal message LOL. 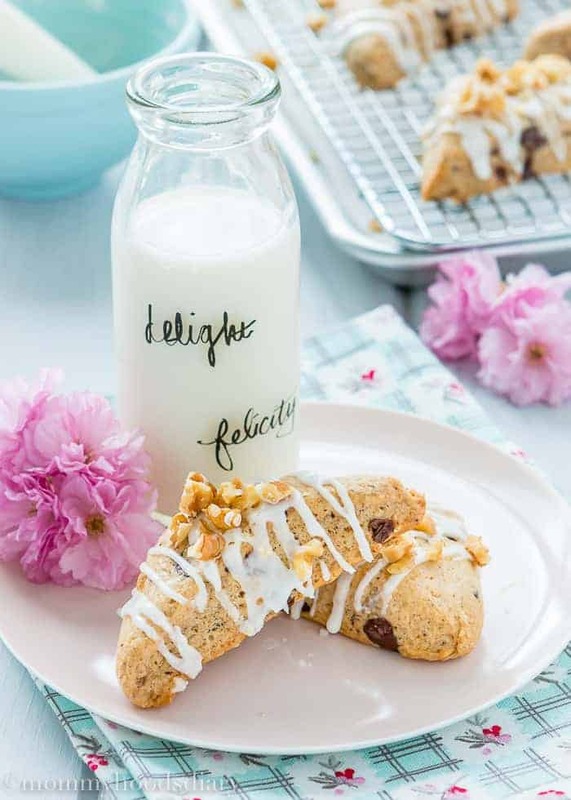 These decadent Eggless Chocolate Chips Scones are unbelievably easy to make. It’s practically impossible to mess up. They are rich, flakey and buttery. 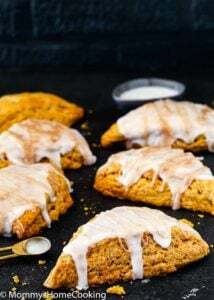 The glaze is optional– trust me, these scones are amazingly tasty. 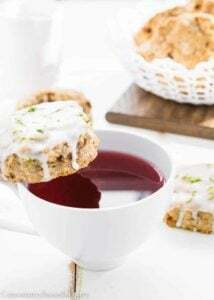 Serve these scones warm from the oven with a giant mug of steamy coffee, tea, or hot chocolate. Enjoy! In a large bowl whisk together the flour, sugar, baking powder, salt, cinnamon, and nutmeg. Add the cold diced butter and using your fingertips, rub the butter into the flour mixture until it resembles coarse crumbs. Toss in the chocolate and mix gently with your hands to combine. 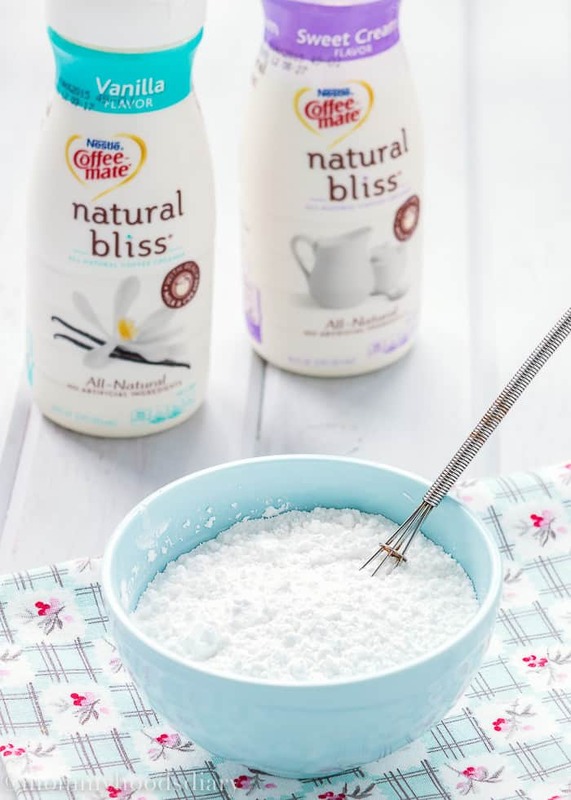 In a separate small bowl whisk with a fork the heavy cream, Coffee Mate and vanilla until combined. Create a small well in the center of the flour mixture. Pour the cream mixture into the well, and stir with a fork until until the dough comes together. Turn the dough out onto a floured surface. Form into a disk, cover with plastic wrap and refrigerate for 30 minutes. Roll dough into a square, about 1/2 to 3/4 of an inch thick. Cut in half vertically, then horizontally to form 4 equal size squares. Then cut each little square diagonally to create smaller triangles. 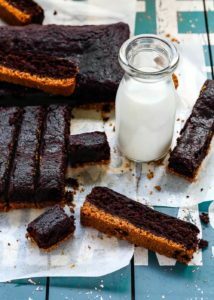 Transfer to a parchment lined cookie sheet and pop your tray into your fridge for 15 minutes. 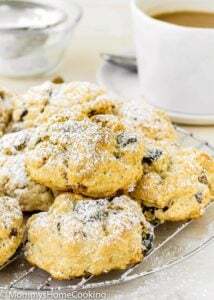 Brush the scones with heavy cream and bake for about 18 to 20 minutes or until risen and golden brown. Remove from oven and allow to cool down completely on a wire rack. Prepare the vanilla glaze: Mix the ingredients in a small bowl until reach the desired consistency and smooth. Drizzle glaze over scones, sprinkle with chopped walnuts, if using, and serve. Avoid over working the dough or you will end up with hard scones. Thanks to our friends at Nestlé El Mejor Nido one lucky Mommyhood’s Diary reader will win a $50 gift card. To enter just follow the prompts in the automated entry form below. 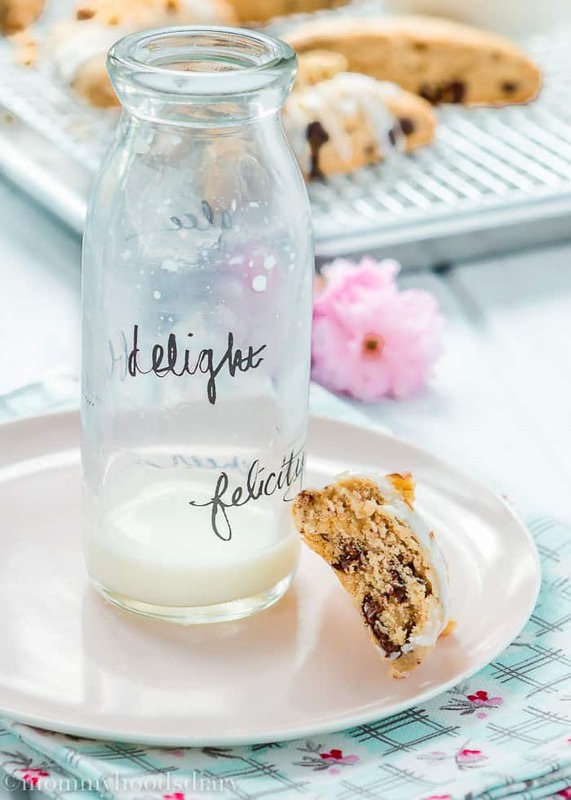 Disclosure: Disclosure: This is a sponsored post in partnership with Nestlé El Mejor Nido. However, all opinions expressed are my own as always. Thank you, though, for supporting them and the other brands which help make this site possible. I think the Mexican Albondigas Burgers look amazing! !